Transport is one of our largest energy expenditures and as a result, is one of the greatest sources of financial cost. In fact, a lot of people spend a good proportion of what they earn at work just to get there. As such, if we can make the transport we use more efficient, we can rack up enormous savings. If you drive to work, the more you drive, the more you stand to save by moving to an electric car, or a different mode of transport. 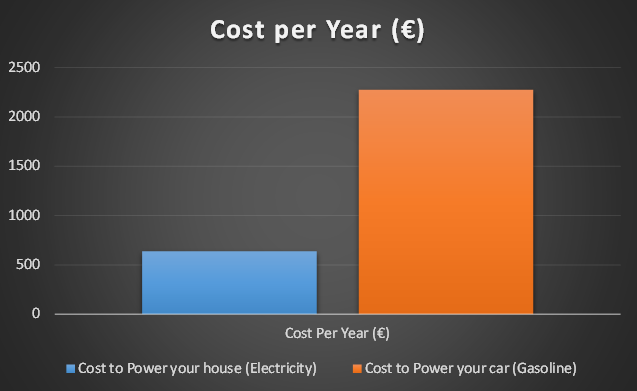 Did you know your car costs about 3.5 times the entire electricity cost to run your house per year? 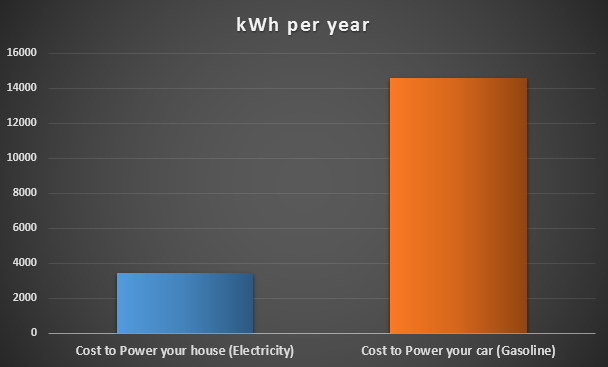 This post will calculate everything in kWh so you can directly compare energy consumption across transport, electricity, etc. to understand the relative costs and where the best savings can be made. So how much energy does your car consume? Let’s look at Transport Costs and Energy Consumption: A reasonably efficient petrol / diesel power car gets about 33 Miles Per Gallon / 12km per litre. That is to say, for every 1 litre of petrol you put into the car, you can drive 12km. Petrol costs vary, but that roughly means you pay €1.50 ($1.70) per 12km, or €1.50/12 = €0.13 ($0.15) per km. The amount of energy in 1 litre of petrol is surprisingly close to the amount of energy in the food you eat. David Mackay makes the fun comparison to a stick of butter, which has 3000kJ per 100g, or about 8kWh per kg . Read the nutrition information on your food to compare how much energy you put into yourself versus your car (note: you are a lot more efficient at turning that energy into motion than your car!). Petrol / Gas has an energy content of 10kWh per kg. A litre of petrol/diesel weighs about 1kg, so it’s also 10kWh per litre. Now we know how many kWh a litre of petrol contains, and how many km we can travel per litre, we can work out how many kWh it takes to go 1 km, and hence, how many kWh our commute consumes / costs. Which is 40kWh per day. At 12km per litre, your car consumes 50/12 = 4.1667 litres of petrol on a 50km commute, which costs 4.16 litres * €1.50 a litre = €6.24 per day. That’s €2,277 ($2500) per year. Our house consumes 3475 kWh per year in electricity. Our car consumes 40kWh * 365 days in a year = 14,600 kWh per year. Wow – that’s way more than our house! How could we go about reducing this cost? The first and most obvious way of removing this €2,277 ($2500) petrol spend is to find a way not to drive. If you buy a bike for $600 and use it for 5 years, that’s a yearly depreciation cost of $120 plus let’s say about $80 in maintenance giving a yearly cost of $200. The full cost of the car includes tax ($500), insurance ($500), Maintenance ($750) and of course depreciation (we’ll go with a second hand car bought for $15000 and used for 7.5 years, so $2000 per year). That adds up to $2500 + $500 + $500 + $2000 = $5500 per year. So let’s start with removing the car completely: If you could move closer to work so you could walk or cycle, you’d save $5500 per year every year. That means if it costs $50,000 for you to move house/apartment closer to work, that move will pay for itself in less than 10 years, and save you $110,000 over the next 20. It’ll probably mean a much higher quality of life too. A price comparison between walking, cycling, driving and public transport looks like this. For walking, I’ve factored in $50 per year for a new pair of shoes. In reality, walking and cycling will probably save you much more in long term health costs than they will cost. The price of public transport will vary wildly, so let’s go with $5 per day * 365 days a year = $1,825 per year. As a side bonus: There’s almost a direct correlation with how little a mode of transport costs, and how it will effect your life . Cheaper modes of transport get their energy from you in the form of exercise, which makes your cardiovascular system more efficient, which makes you live longer. Sedentary modes of transport reverse this process and decrease your life expectancy. Energy needs to come from somewhere, and it would tempting to think that the production of the extra food required by cyclists to power their journeys increases the energy consumption. It turns out this is not a big effect, because human efficiency in the conversion of thermal energy in food to momentum via muscle power is not constant. The more you use your muscles and cardiovascular system, the more efficiently they burn food. The end result is that food consumption stays about constant, and cycling and walking come out as by far the cheapest and lowest energy consumptive ways of travelling. I can’t stop driving – how can I make driving cheaper and more efficient? So now we know the basics. If you can: walk or cycle. If you can’t, public transport is probably best when we include the capital cost of buying a car. Finally, if you still need to drive, we need to figure out how to make this as financially efficient as possible. You may already have guessed it, this is with an electric car. I will concentrate an entire post on this next. 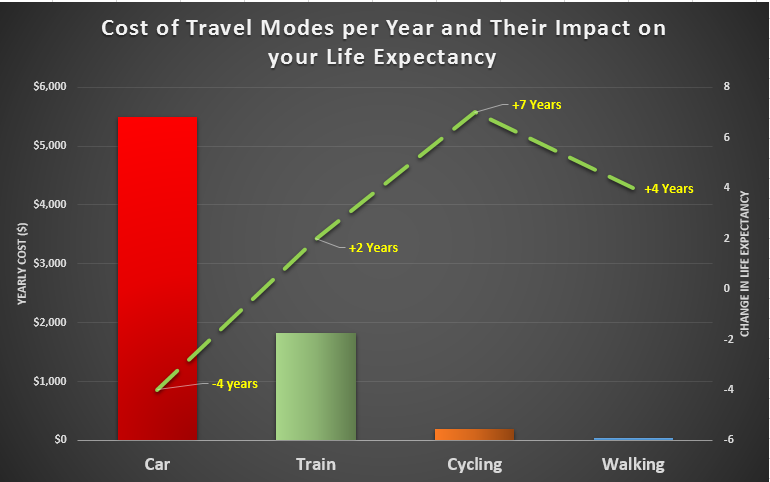 Life Expectancy Changes with transport modes – several references. One, Two, Three, Four, Five.